The World Cup is only 45 days away, with the opening match between host nation Brazil and Croatia taking place in Sao Paulo on 12 June. BBC Sport, with the help of European football expert Andy Brassell, is taking a weekly look at happenings from across the world of football and what impact they could have on the tournament in the summer. Andy Brassell: "It was Ezequiel Garay, and not his Argentine compatriot Carlos Tevez, who emerged victorious in the Europa League semi-final between Benfica and Juventus this week, despite the latter breaking his extraordinary five-year goal drought in European competition. 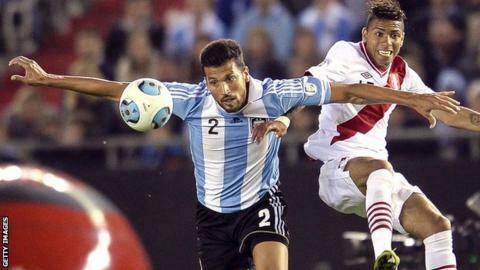 "While Tevez is unlikely to make Alejandro Sabella's squad, Garay's place in Argentina's starting line-up is all but guaranteed. He will be Sabella's key man in defence, an area generally believed to be the weak point of one of the tournament favourites. The centre-back will be relied on to shore things up so Lionel Messi can flourish unperturbed. "Few thought Garay would still be at the Estadio da Luz this season. Manchester United were expected to complete a deal for the 27-year-old last summer, and he also came close to joining Zenit St Petersburg in the winter window. "Benfica are delighted Garay has stayed. An equally tough and cultured defender, he is also a danger in the opposition penalty box. His headed opener against Juve was his eighth of the season, one behind his personal best of nine for Racing Santander in 2006-07. "Many of Garay's Racing goals were free-kicks and penalties; an opportunity largely shut off when he began to play for Real Madrid in 2009. He may decide his status at Benfica is not worth trading - 'My wife and I are very happy here and hope to stay for many more years,' he said recently - but temptation will come knocking if he continues his current form in Brazil." Andy Brassell: "With all the concern over Radamel Falcao's fitness in 2014, it has perhaps been overlooked that Colombia have magic elsewhere in their ranks. El Tigre (if he makes it) or any of their other forward options will have the fortune to be fed by James Rodriguez this summer. "After a tricky start, the 22-year-old has enjoyed an excellent season with Monaco, propelling Claudio Ranieri's side to the brink of an automatic Champions League place. Rodriguez produced another of his incisive through balls on Saturday, laying on a goal for Dimitar Berbatov in the 4-1 win at Ajaccio. It was his 12th assist of the Ligue 1 season. Monaco's Colombian midfielder James Rodriguez has been involved in 21 goals (nine goals, 12 assists) in Ligue 1 this season. Only PSG's Zlatan Ibrahimovic has a hand in more (36). "Rodriguez, who joined along with Joao Moutinho from Porto in a joint £60m deal last summer, has also scored nine himself. Ranieri's autumn switch to 4-4-2, with the Colombian playmaker at the tip of a midfield diamond, has been crucial in the success of player and team alike. "Initially trumpeted as a winger on his 2010 arrival in Europe, the left-footed Rodriguez has proven to be most effective in this playmaker role; his clarity of thought is even more important than his speed. "Watched repeatedly by Manchester United before his move to Monaco, he is in the form to make Colombia - with forwards Carlos Bacca, Adrian Ramos and Jackson Martinez also doing well - one of the more potent sides at the World Cup." Januzaj's journey to continue to Brazil? Few outside of Manchester United would have been familiar with the name of Adnan Januzaj 12 months ago. But the 19-year-old attacking midfielder has enjoyed a rapid rise this season - one of the few bright spots for the Old Trafford club - and now it could end with a trip to the World Cup. Brussels-born Januzaj has decided to represent Belgium after an international dilemma which could have seen him play for Kosovo, Albania, Turkey, Serbia or, potentially, England. Veteran Australia star Tim Cahill says his body "feels amazing" ahead of the World Cup after recovering from a hamstring injury. The ex-Everton midfielder, 34, says his move to Major League Soccer with New York Red Bulls has helped prolong his career. "I love the MLS - I have a life. In the Premier League, what people don't understand, is that you play three games a week and you live like a robot," he told the BBC World Service. "Now I get to pick my kids up from school, spend more time with them and also have the chance to recover from games a lot better. "If anything my body feels amazing. I have a body maintenance programme which helps me play far beyond what I would do in the Premier League. I feel like I've got many years of football in me." Argentina, one of the favourites to win the World Cup in neighbouring Brazil, face an anxious wait over the extent of an injury picked up by Napoli striker Gonzalo Higuain over the weekend. The 26-year-old former Real Madrid man, who is expected to lead the Argentine forward line in the summer, had to be taken off on a stretcher in the final moments of Saturday's goalless draw with Inter Milan. He fell to the ground clutching his right leg after he was tackled by Inter player Marco Andreolli as he was lining up a shot. Roma hope to tie down Bosnia midfielder Miralem Pjanic before the World Cup, where the Italian club have hinted they believe he will impress potential suitors. Born: 2 April 1990 in Tuzla, Bosnia and Herzegovina. International career: 46 caps and eight goals for Bosnia and Herzegovina. Stat attack: Pjanic has scored six goals in this season's Serie A - as many as he had netted in the previous two campaigns combined. Pjanic is thought to be a summer target for French champions-elect Paris St-Germain, with coach Laurent Blanc fuelling the rumours after admitting in the January transfer window that he was a target. "In football surprises are the order of the day, but we speak every day with the player and I think that a positive resolution will come before the end of the season," said Roma sporting director Walter Sabatini. "After that the World Cup begins and things would become altogether more complicated." Pjanic impressed again for the Giallorossi on Friday as he starred in their 2-0 win against AC Milan, opening the scoring with a stunning goal two minutes before half-time. Spain midfielder Thiago Alcantara took a positive step in his bid to be fit for the World Cup when he returned to training with Bayern Munich this week. The 23-year-old partially tore the medial ligament in his right knee last month, but rejoined his team-mates at Bayern's Saebener Strasse training ground over the weekend. The Bundesliga champions are hoping Alcantara will be able to play again with two weeks left of the season. Fifa has again dismissed security concerns for fans travelling to Brazil this summer after more violent clashes between police and residents in Rio de Janeiro this week. Violent protests erupted after the death of a dancer on a well-known television show, with residents blaming police for his death. They burned rubbish, set up barricades and blocked roads in and around the streets leading into the area. Police fired shots, killing another man. However, Fifa secretary general Jerome Valcke said the scenes could happen anywhere and pledged they would not affect football fans. "The way you talk about it it's as if there was a revolution," Valcke told a reporter who asked about the unrest. "I never had any doubt that security for the World Cup would be put at risk. I am sure the security during the World Cup will be as high as possible. It's possible that something happens but that could happen in any country." World Cup watch: Cavani struggles a boost for England?